Mile High bingo has been blacklisted due to breach of contractual terms and conditions which was closely followed by closure of their affiliate programme. The site failed to pay commissions generated by referred players closing its doors to all affiliates. This is viewed as pure theft and Bingo Reviewer strongly advise all players to pick one of our white-listed casinos instead. You will be finally high alright every time you win one of the amazing Jackpots at Mile High Bingo. Whether it is by train, plane or automobile getting there couldn’t be faster than a click on your keyboard where a million is up for grabs every week. Maybe it is because the internet is in cyber space or that the fastest way to your bingo destination is the internet. Whatever the reason the airport themed web design gives Mile High Bingo a zest that no other site has. From the lookout tower to the tabs that artfully displayed airline waiting room seats it is definitely a flying high experience. Navigating is made quite simple with all the special features viewable without having to register first is a nice touch. Once you do join Mile High Bingo it takes but a moment without having to reveal credit card details to gain access. Games are powered by Dragonfish software and with a platform like this players can’t go wrong for an outstanding line up of products. They have climbed the ladder of success with outstanding games and state of the art graphics and animation to match. Mile High Bingo is licensed by the Government of Gibraltar. If you have never played the Swedish version of Bingo this is the ideal time to try it out with the High 5 Bingo game. It is quite different from the more traditional bingo games you may be used to because there is up to 5 ways to win. 90 ball bingo offers three ways to win with one line, two line and Full House. Guaranteed Jackpots with one million Coverall games will surely grab your attention and send your imagination reeling at the prospect of winning it. There is an amazing bingo schedule of Guaranteed Jackpot Coveralls you won’t want to miss. The platform includes a full casino loaded down with some pretty spectacular Slots. The coin value per line fits every type of wager starting at one penny per line. The animation and graphics are Vegas style quality and offering the same Slots found in Vegas casinos. Play your favorite land based Slots in the comfort of your home with Cleopatra, Monopoly and Wheel of Fortune. Besides some pretty amazing Jackpots regularly offered there is also Free Bingo rooms that are available every day with an amazing £6,000 a month up for grabs. 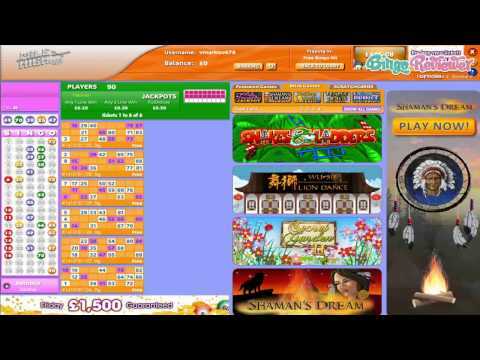 Win real cash prizes playing with bingo tickets that are completely Free. Marketing department is keen to what players want in promotions and have developed some awesome offers. You will find all the standard offers including the Refer a Friend Bonus, Happy Hour where you can double your Loyalty Points and an impressive Loyalty program. Join Mile High Bingo today and receive a Deposit Bonus on your first Deposit. Don’t worry because the Deposit specials keep right on coming with generous offers running all the time. You won’t ever feel like you are not special because the Mile High Club rolls out the red carpet to all players. You will be instantly part of this prestigious club from the moment you join and can move up the four tiers where the benefits get bigger and better. We rate Mile High Bingo with 4.25 Pink Hearts. The games here are pretty typical of dragonfish software and they offer three types of bingo: 75 and 80 ball and high five bingo. They’ve got some pretty decent coverall and progressive jackpots up for grabs on a regular basis. They tend to be a bit limited on variety. They basically only offer bingo and slots and don’t get me wrong, that’s basically what I like to play but sometimes it’s nice to mix it up a little. There are so many other sites that offer much more. The free bingo they offer isn’t bad. No matter who you are, how often you play or how much you spend, you’ll have full access to free bingo every day! Non-funded players can head to the free for all room each day from 7am to 7pm for sessions occurring every 8 minutes. Funded players can enjoy the same privilege every single day as well from 4pm to 7pm, every 15 minutes. This has quickly become one of my favorite sites. I really like the sense of community here. Everyone is very friendly and the customer support really stays on top of things in a speedy and kind manner. They offer three types of bingo here, including Swedish bingo which is one of my favorites. It spices things up a bit and makes for an even more exciting game. Coveralls and progressives are up for grabs taking things up even an extra notch. They also offer team bingo and you can never go wrong with that! I always have a blast playing team bingo and I really think it should be a standard thing at every bingo site. I think a lot of people really tend to like it and even prefer it! The free bingo here is well worth it too. Players can take advantage of it daily and they don't exclude non-funded players. I would definitely recommend this site to others! Mile High is not usually associated with Bingo or Casino sites, but I guess that is about to change. This is one of the better sites I have played on, and as your typical UK site, you can celebrate the birth of the baby Prince with a code that will give you a nice 200% bonus to start with. In other words, you have to make a deposit first to get the bonus. I appreciate when you get a real phone number to contact the support, as it is always better to speak in person to someone if you have a problem, then to write emails or chat. In this case, their representative was more than good, polite and quite informative, so no complaints there. As for the bingo games, you can play 75 and 90 ball games at the moment, with a schedule you can check, so you can plan the games and buy the tickets in advance.